It seems pretty well agreed that poetry was in ancient times considered a utilitarian art, a net of rhythm, rhyme, and repetition for catching such things as the 12 chapters of Gilgamesh or the 15,693 lines of the Iliad and many other stories that were unfortunately buried with their chanters before anyone had scratched the rhymes into terra cotta or inked them on goatskin. More recently—by which I mean over the last 2,500 years—poetry’s utility has been a disputed matter, with views of it ranging all the way from useless and dangerous to necessary for human flourishing. Plato, for example, wanted the stuff out of his ideal republic, fearing that noisy rhapsodizing about images of the world would distract philosophers from their study of what was real. Stalin, to cite another literary critic with political ambition and notions of a perfect society, was not quite so honest or fair-minded as Plato, encouraging his poets to sing until the tunes displeased him and he then killed the singers or dispatched them to the harsh edges of his empire. Such was the fate of the great Russian poet Osip Mandelstam, who in the style of the ancients, though for very different reasons, recited certain of his verses from memory only, not daring to publish them. One work, “Stalin Epigram,” which contains the lines “His cockroach whiskers laugh, / And the top of his boots glisten,” was memorized by a quisling friend, which ultimately lead to Mandelstam’s removal to Siberia, where, as was the custom, he died of unknown causes on an unknown date and was buried in an unknown grave. 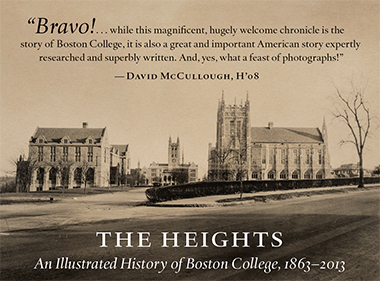 Our profile of the poet Brendan Galvin ’60, begins here.